In this New York Times bestseller, two women in different eras face similar life-altering decisions, the politics of exclusion, the terrible choices we face in wartime, and the redemptive power of love. In 1945, Elsie Schmidt is a naive teenager, as eager for her first sip of champagne as she is for her first kiss. She and her family have been protected from the worst of the terror and desperation overtaking her country by a high-ranking Nazi who wishes to marry her. So when an escaped Jewish boy arrives on Elsie’s doorstep on Christmas Eve, Elsie understands that opening the door would put all she loves in danger. Sixty years later, in El Paso, Texas, Reba Adams is trying to file a feel-good Christmas piece for the local magazine, and she sits down with the owner of Elsie's German Bakery for what she expects will be an easy interview. But Reba finds herself returning to the bakery again and again, anxious to find the heart of the story—a story that resonates with her own turbulent past. For Elsie, Reba’s questions are a stinging reminder of that last bleak year of World War II. As the two women's lives become intertwined, both are forced to confront the uncomfortable truths of the past and seek out the courage to forgive. 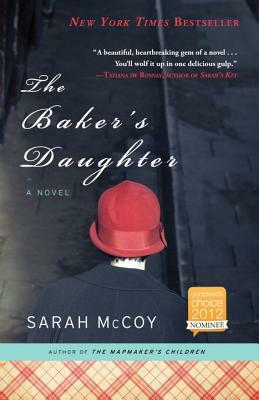 SARAH MCCOY is the New York Times bestselling author of the novel The Time It Snowed in Puerto Rico. She has taught at Old Dominion University and at the University of Texas at El Paso. The daughter of an Army officer, McCoy spent her childhood in Germany. She currently lives with her husband in El Paso, Texas.